Uses: as a tonic; for skin care. Geranium can be good for pre-menstrual tension or menopausal problems. A very popular all-round oil, geranium, or more properly, pelargonium, has a scent which almost everybody finds highly attractive. It is a safe, uplifting, body-cleansing oil with a long tradition through its wild equivalents, herb Robert and cranesbill. Although these have many specific uses in herbal lore, for example in cures for dandruff, sterility and peptic ulcers, geranium oil in family aromatherapy is most important for its ability to lighten the mood and to help with skin care. Pelargonium graveolens is the geranium used for oil extraction, one of many hundreds of varieties bred from the African original since it was brought to Europe 300 years ago. The essential oil is distilled mainly from the leaves and is middle note. You’ve see those television advertisements suggesting you should take such and such a pill to relieve your tense, nervous headache? Instead, use geranium oil. When the day has given you a battering and your spirits need a lift, this is the one that should be used. Methods for geranium as a tonic: water; applicators; vaporizers; massage. This is a cleansing, toning, sharpening oil and so is helpful with those problems which come with greasy, over-oily skin. It can help you deal with cold sores, chilblains and weather-beaten skin. 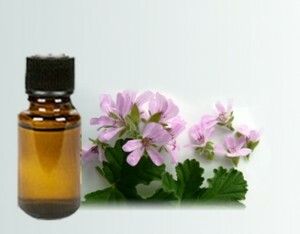 Used as a gargle, just a couple of drops in warm water, geranium has a soothing effect on sore mouths and throats. Methods for skin care: water; applicators. Geranium is classed by perfumers as both a male and a female-attracting scent and is recommended for stimulating hormone production. Some experts say it can be helpful where certain urges don’t seem to be quite so urgent any more, but in any case its lively, flowery smell can only act positively in a romantic situation.